Those who think that we stay in Padmasana and meditate for hours, and those who think that we spend our days with the feet behind the head standing on one hand. But there are so many options between those two ideas, and one of those options is practicing yoga sitting on a chair. In fact, if you think about it, not everyone can practice standing, for many different reasons. The chair becomes a yoga prop, it becomes the yoga mat. This kind of practice is not only (as you could think) for the elder people, it’s also for people with health issues, or people that can’t use their legs for some reasons, but also for people at the office that don’t have the time, neither the space for a more traditional practice. 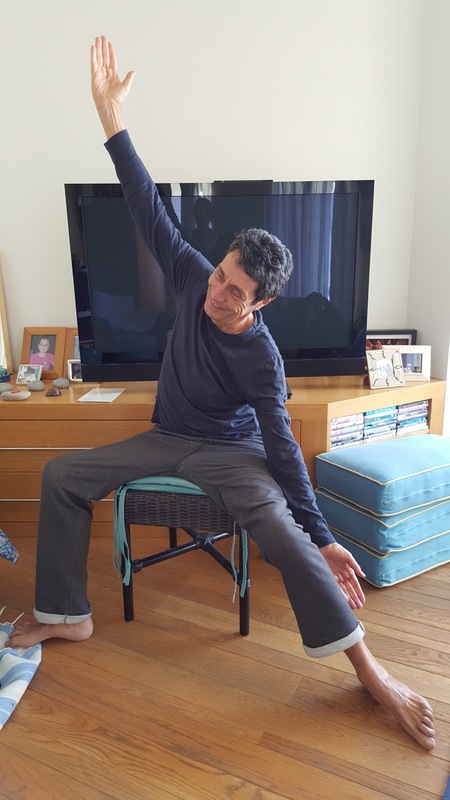 By practicing on a chair they can still relax, release the tensions, and move their body. It’s beneficial for the body and the mind. Practicing on a chair allows to modify a lot of traditionnal postures by making them more accessible for any kind of people/bodies. There are many postures you can do seated, a lot of twist that allows you to stretch your back and massage your internal organs, some hip openers, shoulder openers… There is also the possiblity of using the chair as a support for a standing posture, such as triangle pose or tree pose for example. Some people with balance issues might find it very helpful. In fact, this practice benefits to every part of the body, it allows a better bloodstream, improves balance in a significative way, detoxifies the body, ameliorates the posture and the flexibility. Moving makes the mucles more active so they get stronger, and we can say the same about the bones too. The simple fact of moving a little, can give a person whith a disability or a health isuue, new hopes, and a better self esteem. Simple things like a better balance or a bigger range of movements, even the releasing of tensions, allow inner peace. Someone stressed by a long day at the office can easily make this observation. Like in a more traditionnal yoga practice, the relation between the body and the mind is better, even the spiritual aspect of yoga can be shared. The practitioner learns how to breath in a better way too. All of this increase the well being and can even offer a better health. Chair yoga is definitely an amazing option that should be more offered. Stay tuned for other thoughts about my experience as a yoga teacher! Namaste.